If there's something I really love about summer, it's spending all these sunny days outdoors as much as we can and what a better thing than enjoying a real cute picnic with your family and friends. We still have a few weeks of lots of Vitamin D and I'm planning to enjoy them eating outdoors with my little ones. Nico finally understood the concept of a picnic this year and he is completely obsessed with them, asking every single night if we could do one. Even when it's raining he simply sits on the floor and eats indoors, I have a #threenager remember? Last week I organized a special one celebrating Olivia's month seven, she's SO big already! and between carrying everything I needed and trying not to forget any details, I put together a list of all the essentials you'll need to make your life easier and happy. Guys, I take picnic very seriously as you'll see. This is the essential item for your picnic and if you don't own one I recommend you do. We bought ours and I carry it on my stroller, everyday picnics! In this case, I bought a really cute pineapple acrylic tablecloth for our table that I reused later on for other occasions. I don't own one but I have a cute bike basket that I used, that is practically the same as a picnic basket. You can simply use this idea or carry a big bag with all your essentials. I tend to buy eco alternatives for our picnics so you won't waste anything and come on, aren't they the cutest option? Always bring extra napkins and tea towels, mini mason jars to carry over sauces and dips, acrylic glasses and cups and a good knife, that will always come in handy. I wanted to do something scrumptious that day so I decided to use Foodora that afternoon. I love Foodora's concept where they can deliver anywhere, anytime. This picnic plan was a total fuss free and I had in mind ordering a bite-size option. 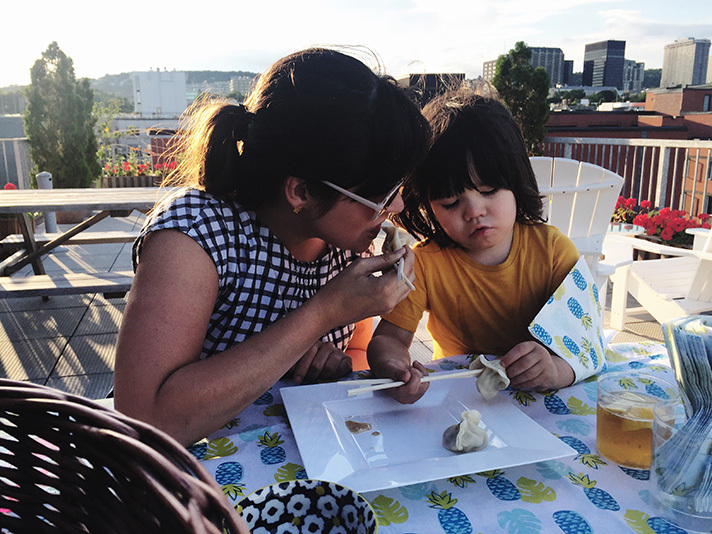 I'm such a dumpling fan so I thought it was a perfect option to have our favorite ones delivered to the comfort of our terrace without carrying anything extra or in the need to cook something a few hours before. Next time you're dying to put together a picnic outdoors, have them in mind, they can deliver to your next outdoor party in the park, pretty cool right? Maybe something you won't need if your space is limited but I brought a small bouquet, a napkin holder, candles, and some extra small serving bowls that day. A pair of garbage bags, a bottle opener and corkscrew, a small cutting board for your snacks, ice cooler and ice. If you're looking for some perfect spots, check below our top 8 locations in Montreal for a perfect summer picnic. DISCLAIMER: Thanks to Foodora, for delivering our food on this lovely picnic day. What a great idea! That spot is gorgeous! Very sweet photographs! My family and I live in Detroit and we love exploring our city, too. Aww I love this, such a great idea for a picnic!